Tayde, A., Gupta, V. (2013). SWI: Probe for neuroradiologists. International Journal of Advanced Biological and Biomedical Research, 1(2), 159-160. Atul T. Tayde; Vinit Gupta. "SWI: Probe for neuroradiologists". 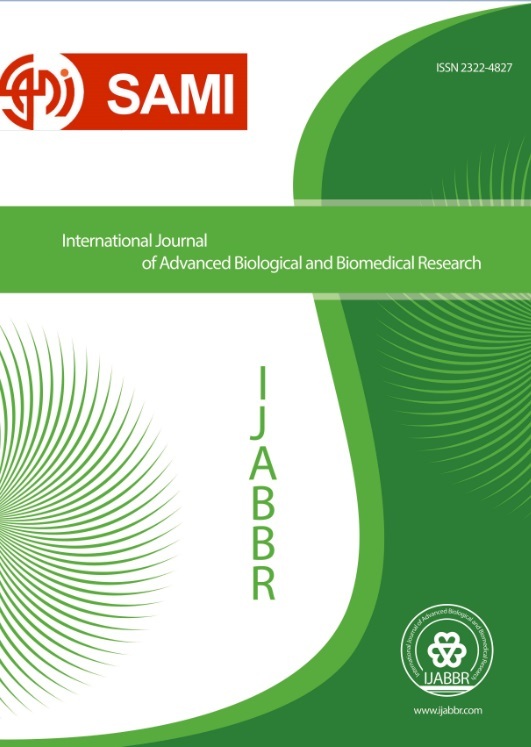 International Journal of Advanced Biological and Biomedical Research, 1, 2, 2013, 159-160. Tayde, A., Gupta, V. (2013). 'SWI: Probe for neuroradiologists', International Journal of Advanced Biological and Biomedical Research, 1(2), pp. 159-160. Tayde, A., Gupta, V. SWI: Probe for neuroradiologists. International Journal of Advanced Biological and Biomedical Research, 2013; 1(2): 159-160. Susceptibility-weighted imaging (SWI) has continued to develop into a powerful clinical tool to visualize venous structures and iron in the brain and to study diverse pathologic conditions. It is a new art which evaluates and exploits the properties of blood, iron and other tissues. It is a magnitude or filtered phase images or combination of both, obtained with high-resolution 3D fully velocity compensated gradient echo sequence, The paramagnetic substance like deoxyhaemoglobin, product of blood degradation, ferritin, a non-heme iron are known causes of magnetic susceptibility in the tissues. SWI offers a unique contrast, different from spin attenuation, T1, T2, and T2. Edema is identical on SWI as on FLAIR because of short TR and long TE but does not reveal CSF signal because of low flip angle.SWI is not affected by low flow velocities and very useful for detecting vascular pathologies. With the advent of parallel imaging and the greater availability of clinical 3T MR images, it is now possible to image the entire brain with SWI in roughly 4 minutes.SWI images are best at higher SNR ratio, so quality is good at 3 T machine. It can also be performed on 1.5 T machine. SWI has been found to provide additional clinically useful information that is often complementary to conventional MR imaging sequences used in the evaluation of various neurologic disorders, including traumatic brain injury (TBI), coagulopathic or other hemorrhagic disorders, vascular malformations, cerebral infarction, neoplasms, and neurodegenerative disorders associated with intracranial calcification or iron deposition. As neuroradiologists become more aware of these various applications and as advances in software technology permit easier acquisition and better interpretation. Although SWI interpretation will require some experience, increasing its clinical use will, no doubt, reveal new applications. To date, the strongest indications for SWI are in neurovascular and neurodegenerative disease applications. On the basis of additional information provided by SWI, we can define a standard neuroprotocol, including conventional MR imaging, diffusion tensor imaging, PWI, and SWI. The major areas are the following: aging, atherosclerosis,MS,occult vascular disease, stroke, trauma, and tumors.With the new advent we can not only diagnose the pathology but also can monitor the progression of the neurological disease process.